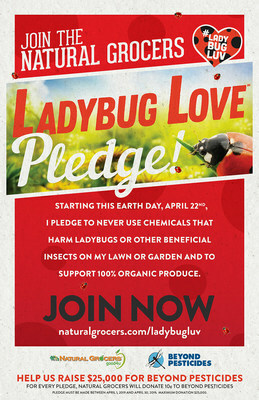 DENVER, April 4, 2019 /PRNewswire/ -- Throughout the month of April, and in celebration of Earth Day on April 22, Natural Grocers will invite the community to pledge to protect one of nature's most beneficial insects – the ladybug. Shoppers will be asked to never use chemicals that harm ladybugs or other beneficial insects and pledge to support 100 percent organic produce. For every pledge, Natural Grocers will donate 10 cents, up to a total donation of $25,000, to Beyond Pesticides, a non-profit organization that works with allies in protecting public health and the environment to lead the transition to a world free of toxic pesticides. "Since the very beginning, Natural Grocers has been committed to selling only organic produce, which is grown without toxic pesticides, herbicides and genetically modified organisms (GMOs)," said Natural Grocers Co-President Kemper Isely. "By partnering with Beyond Pesticides, we hope to provide consumers with the ability to make informed choices and adopt practices that protect themselves and their families from unnecessary exposure to toxins." This Earth Day, Natural Grocers is focusing on seemingly abundant creatures that are often take for granted: insects. Insects play an essential role in the productivity of our food supply, and their recently noted decline cannot be ignored. Recent studies indicate that insect populations are down more than 75 percent over the past three decades. Natural Grocers is dedicated to supporting regenerative farming practices that use ladybugs and other beneficial insects instead of harmful chemical pesticides to control pests. This provides beneficial insects a healthy and safe environment in which to thrive, thereby supporting the integrity of our ecosystem, food supply and economy. Learn more. In addition to the pledge, Natural Grocers will hold a 3-day sale from April 22 to 24 featuring products from a variety of environmentally-friendly suppliers. On Earth Day, April 22, Natural Grocers will offer customers a free reusable shopping bag1 with purchase and the chance to win Natural Grocers gift cards2. Since Earth Day 2009, Natural Grocers has led the fight to reduce single-use plastic bags and end food insecurity in the communities they serve, by eliminating single-use plastic and paper bags from checkout lanes and by donating five cents to local food banks every time a customer shops with a reusable bag. As of the end of March, Natural Grocers estimates it will have eliminated more than 300 million single-use plastic bags and will reach $1 million in total donations to food banks associated with all 152 Natural Grocers stores. In addition, during the month of April, Natural Grocers will also donate $1 for each purchase of the new Ladybug Love reusable shopping bag to associated food banks. Non-toxic cleaning and sanitizing products. Minimum sufficient packaging on Natural Grocers' brand products. Recycling pallets, plastic pallet wrap and cardboard shipping containers. Public recycling centers supported at select stores. Low-watt recirculating fans, super-efficient climate control systems and LED lighting. 100% USDA certified organic produce. Natural Grocers offers 100 percent organic produce, meats that are sustainably and humanely raised without antibiotics, hormones or other growth promotants, 100 percent free-range eggs, 100 percent pasture-based dairy, 100 percent non-GMO bulk products, groceries that don't contain any artificial colors, flavors, sweeteners or preservatives, the highest quality supplements, paraben-free body care products and all-natural cleaning products. Natural Grocers is also committed to supporting regenerative farming practices that support the triple bottom line. Natural Grocers by Vitamin Cottage, Inc. (NYSE: NGVC; NaturalGrocers.com) is an expanding specialty retailer of organic and natural groceries, body care and dietary supplements. The company offers a flexible, neighborhood-store format, affordable prices and free, science-based nutrition education programs to help customers make informed health and nutrition choices. Founded in Colorado in 1955, Natural Grocers has more than 3,500 employees and operates 152 stores in 19 states. 1 Limit one per customer. Valid April 22, 2019 only at participating Natural Grocers stores. Quantity limited to stock on hand; no rain checks. 2 NO PURCHASE NECESSARY. A PURCHASE WILL NOT INCREASE YOUR CHANCES OF WINNING. OPEN ONLY TO LEGAL RESIDENTS OF THE 50 UNITED STATES AND THE DISTRICT OF COLUMBIA, 18 YEARS OR OLDER. VOID WHERE PROHIBITED BY LAW. Sweepstakes starts and ends on April 22, 2019. For Official Rules and complete details, visit: www.naturalgrocers.com/sweepstakes. Sponsor: Vitamin Cottage Natural Food Markets, Inc.